I had the good fortune last weekend to travel to Georgia to kayak the Chattooga and Talula Rivers in north Georgia. 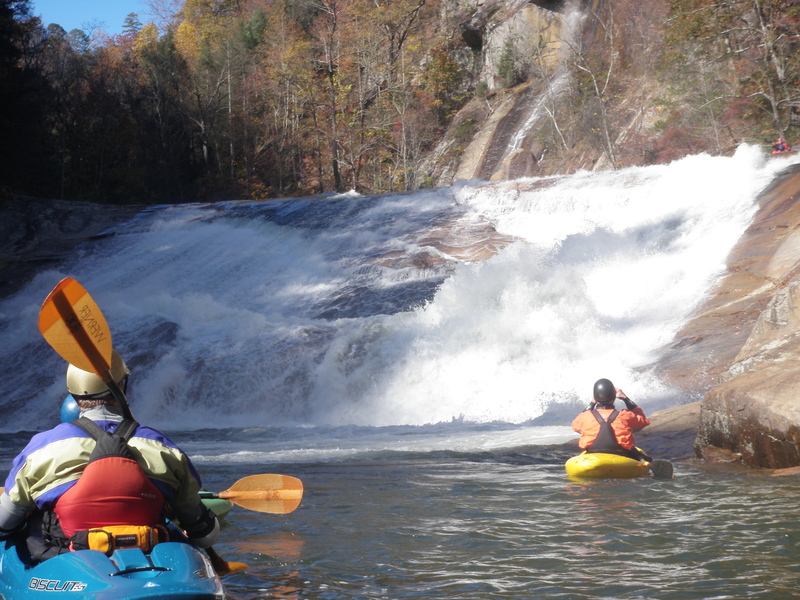 My good friend Joe picked me up in Atlanta and by 10:00 a.m. the next morning we were on the Chattooga with Nick and Ted. With the river running at 2.5 feet it was a different experience than my first run down it a few years ago at 1.1. And the excitement factor was much higher. 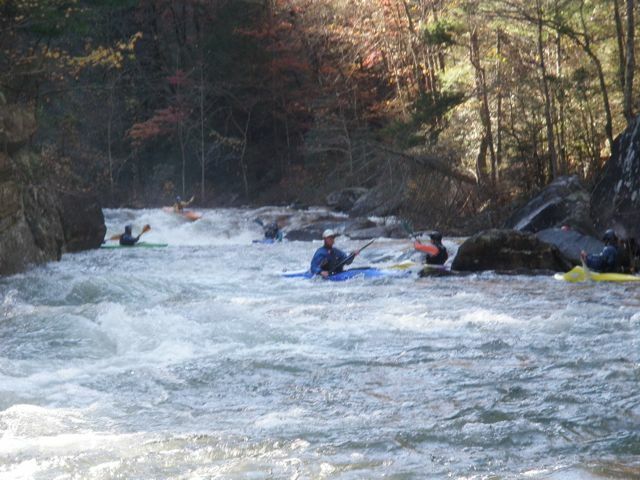 From the entry drop at Bull Sluice, through Screaming Left Turn, and onto Woodall Shoals and Nine Foot Falls, the river came fast and heavy at a solid class four. Joe, Nick and Ted have all run this stretch many times and we pushed on without needing to scout anything, me following instructions and boats to stick to the lines. I was flipped briefly in Raven chute as I missed the pillow ferry and washed through the hole below. I was further pushed around in corkscrew where I ran the lower half backwards before eddying out right above the pourover below. We ran the creek right and moved on to Sok ’em Dog where we ran the far left puppy chute a beautiful slot in the granite dropping the paddler steeply off the entry and flinging us out into the calm below. 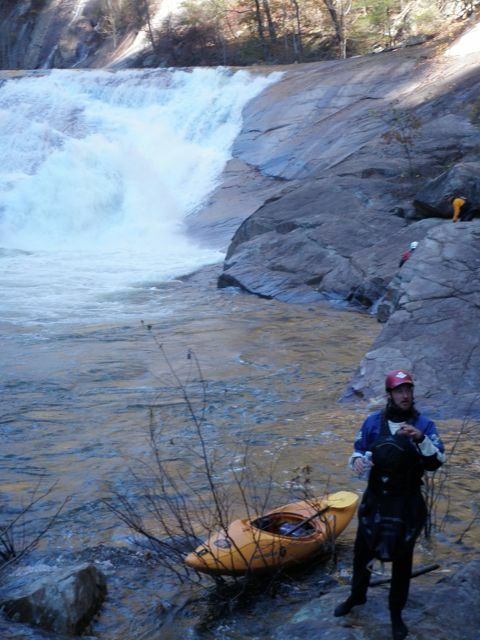 The euphoria had kicked in after nine foot falls and the sweet success of finishing the run in style, with beautiful fall weather and a fun group of paddlers worked my psyche for the best. Adrenalin never really stopped its slow leak into the bloodstream, for the next day we planned on running the Talula Gorge, which has a dam release every November on the weekends and then again in April. With its third rapid a 70′ slide through a massive rooster tail, video of it had convinced me I wanted to run it but had also filled me with anticipation anxiety. 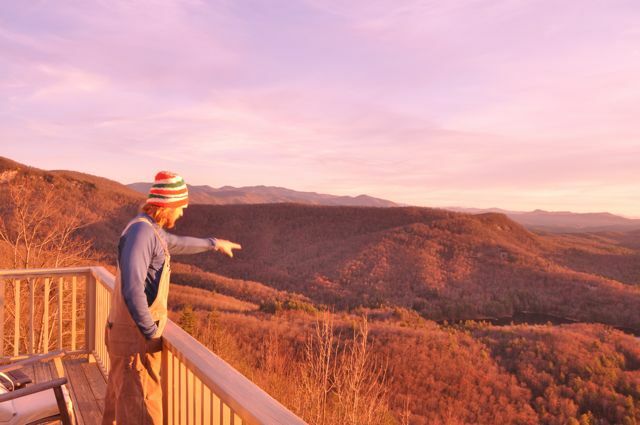 We spent the night in the mountains of North Carolina at 4000 feet and with a stunning sunrise filtering over the far eastern ridges, I awoke to a majesty of colour with the spread of a lake still in its darkness while the high blue ridge eventually fired up with the predawn and then the first rays of the sunrise. 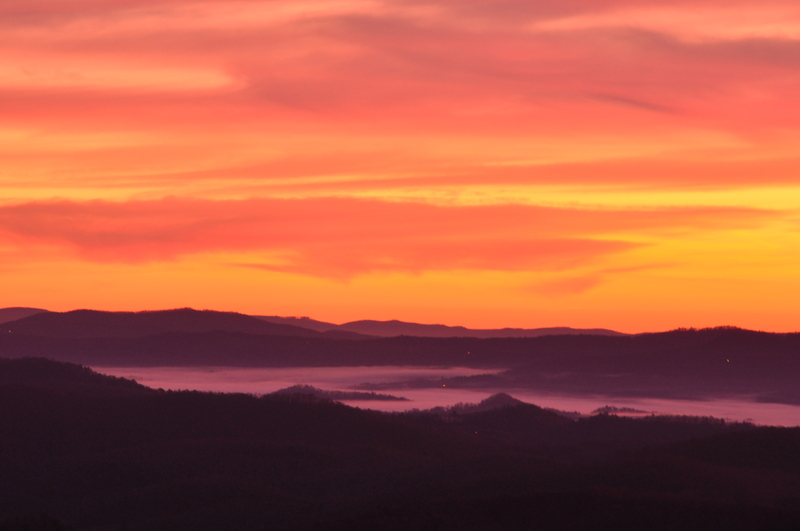 The sun risen glared on me then making the day new and fresh. After a hearty breakfast with review by video of our Chatooga run of nine foot falls, we headed for Talula. The drive remained on the high moutain facing east with amazing long , clear views of the front range in the distance down through the hardwood forest with pine dustings. Descending the mountain in Clancy we drove the main road to Talula’s takeout on the same lake as the Chattoooga run further downstream. The lead up to our hiking descent down in to the gorge had been a long time built up over years. 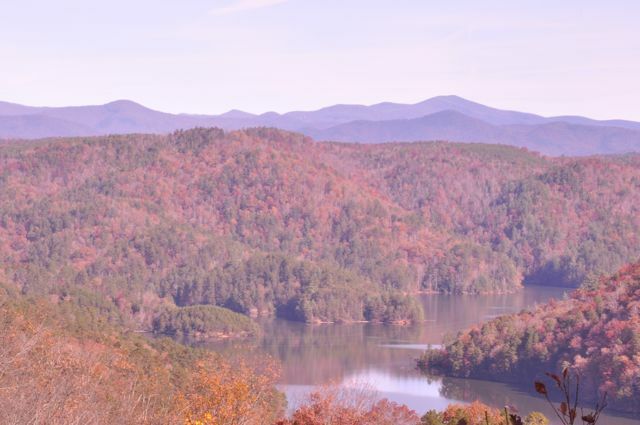 Joe had first mentioned the Talula four years ago when I first visitied for kayaking the Chattooga at 1.1. We had driven over the high trestle bridge and Joe had made a great story for the Talula and its charm and beauty and significance as a solid whitewater run. And I was therefore eager to make the day happen and work out. Descending the 600 steps to the water’s edge took me time with the Phat. In the roar of upstream waterfalls, and rainbows of sunshine sneaking past hardwood glory I descended deep into thoughts of concentration, committment, skill….and breath. I was warmed up from some yoga and found myself sweating inside Joe’s purple pile t-shirt. Shade took over quickly after handing in my permit and starting the descent, the air temperature dropping a full ten degrees riverside. Launch off the last three stairs and a rock edge into a right eddy or ferry across to a boulder eddy. Adjusting to the different boat left me scant time for zen moves on the river at first drop. 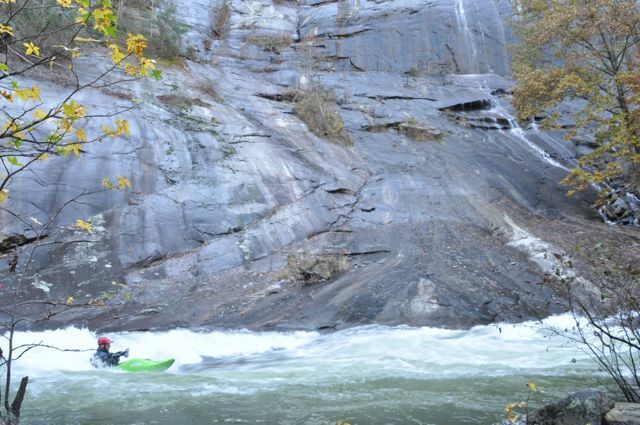 Line up for a series of two foot drops into a left trending wall of bedrock on river right, follow the fast water through a constriction drop into a swirling recovery eddy. Catch breath. Head river right from left eddy on a quick ferry, gun for right entry and boof eddy guarding watered rock. Nice spell below with the horizon line turn entering from deep shade into brilliant sunshine at Oceana. The Thing in Oceana is a big caulifower on river left. It forms from a collision of the falls and a left trending ledge which runs downstream gently from the right. The break through this ledge is on the left at the Thing. Hit the thing on the left and facing left and all should go fine. We all made the initial rapids and holed up at the summit of Oceana while Ted climbed out and set up the video camera, a nice hi-def model. With him in place there was nothing left to do but take the plunge. Joe, Nick and I had not scouted, relying on Ted as spotter and experience to make it through okay. I did not want to look at it from shore. I had seen some footage and felt set. I wanted to see it live first from the cockpit. Eddy out make the downstream turn, line up for left side run below shrubs and paddle towards left side of initial wave/rooster tail. Steve hit his gravity and Nick got the thumbs up from Ted filming after a short period of time. Nick dropped in a bit right of Steve. Justin lined up left and floated down the slide relaxed. Joey took a line and I watched him closely. Lining up for the top required competent paddling to a horizon line and full commitment for what comes after entry. Bouncing over the wave initiates the first face shot and I accelerated rapidly thereafter on the 40 degree pitch. Heading left the kayak skips on another small shelf wave and propels me into the caulifower blooming way over head and delivering the full immersion face shots for which kayaking is well known. I skipped over the toe hole still upright and headed straight. Emerging, alighted and washed in the power of the river, ecstatic and relieved, turning to view the river in all its foaminess. After a river left break in which I videoed some strangers, videoed Ted, witnessed some less perfect lines but no chaos, and rejoiced in our group of 6 success at Oceana. Moving on it comes fast and heavy punctuated by the Gauntlet and Bridal Veil, a solid 4+ where consequences entail a 25 foot slide as the runout into the Zoom Floom. Battle left to the top of the slide. Afterwards, another few drops, and holes, boofs and turns takes the paddler to the Amphitheater. There is a play wave by a big left eddy; fun for a couple rides in Joe’s all-star and I took a break. Pulling out of here the drops are still solid with Be Right Stay Right, the Bowling Alley and the Powerhouse all shaking the river up nicely. By day two I was tired and I got worked in the Gauntlet and was fighting to stay up right on left side brace before recovering and gunning on a upstream ferry river left to make the small sluice run to eddy out above Bridal Veil Falls. I gulped air here as my friends dropped away out of sight again. Taking the minute alone to recover my breath I knew I had my work cut out for me to make this third day of paddling without a scare. Hitting the left line staying upright and headed straight found me to the bottom eddy and entering the Zoom Floom eagerly bouncing off the walls of this narrow channel on river left bedrock. The previous weekend Nick had swam just below here and on day one I rolled over after getting worked. Day two I was stalled out in a hole for 5- 10 seconds before release and working back left. Bowling alley created a cluster of paddlers both days I was there making us run up on each other. I got stuck in the hole there as well on day two and I surfed on the right for another 5-10 seconds before Wes unlocked me from its grip with a collision. Thanks again, as I had made it to the exit of the hole but likely had not the strength to make it fully out alone. Day two also had two swimmers below the Bowling Alley and Joe chased the one boat while its paddler washed up on a stick in mid river. The other swimmer at the same time made it to river right with boat. I slowly followed Joe watching only from my cockpit the stranded swimmer. Joe made the save with Wes in a eddy river right under a cliff. Dumping water and attaching to its throw bag, Joey paddled it over only to miss the throw to Ted anchored on river left because the rope was too short. Away went the boat and rope now with Joe following and then saving it in the next big eddy on river left. With a hefty hike ahead of them and hopefully with paddle this guy reminded us all well to keep fighting for your roll when going over has happened. With the second day running fifty percent higher and with a round of Talula under my belt, it was an exquisite way to finish the weekend with a second trip down the gorge. When I boarded the flight to come home and had all my parts intact and uhurt, I was a bit surprised. Certainly thrilled to have had such a clean and enjoyable weekend paddling class 4 and 5 after a full 6 weeks off from paddling. My flip in Raven’s chute and subsequent roll recovery was so autonomic that I rejoiced in the muscle meory and training that I have been putting into paddling for the last few years since the Grand Canyon cut my teeth. To many more days on beautiful rivers with solid paddlers and friends. Thanks everyone who helped make it possible, Joe and Ted and Glenn for the loan on the boat, I was happy to return it unscathed.